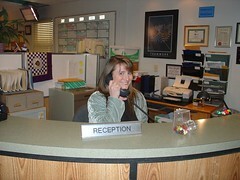 SnarkyDork: "Dunder Mifflin, this is Jodi..."
Yup, Scranton weather was awful, but the people sure were nice! Sounds like a fun day. It's kind of lost on me because I don't watch TV, but it still looks like you had fun. I haven't visited in a while, but playing catch-up, my answer to your playing outdoors as kids question: I was an only child, living on a cattle feedlot in Nebraska. I explored with my dog -- we'd walk through pastures, splash in creeks (that's "crick" to Nebraskans), swim in clay-bottomed ponds. I went to a country school with about 10 other kids, mostly boys. We'd get together sometimes to play hide and seek games that spanned an entire farm -- hiding in the hay, in farm equipment, in feed bunks for livestock. My best friend, Andy, lived on this farm and even had his own horse, but he never rode it and preferred to play Nintendo, which I'd tolerate for a while before insisting we go outside. I can't imagine letting my kids do the stuff I did -- wandering about for hours unattended, far from home. But it's sad we can't do that, too. Admit it, how many candies did you steal? >s.j. : None! I swear! I did pick up the candy dispenser and considered it, but I just put it back down. That picture of you at work is awesome. Your office looks like a nice place to work.